The kingdom of Everealm is overrun by The Darkness. As a last chance to fulfill the prophecy, the three Fates have called 12 Paladins from the realm of Earth, to appear at Castle Sanctum for training as they safeguard the pieces of the sacred Sunspear. There, they will attempt a series of heroic tasks, until at last, only One True Hero will remain to wield the Sunspear and defeat the forces of evil. Now everybody grab a costume and your Tolkien songbook: There’s a goddamn quest on. The show knows it’s dealing with something that’s become mainstream; The Quest explains very little of what’s happening precisely because it knows everyone knows how a quest narrative is built. So what does The Quest plan to do with its cadre of LARPers, then, to set this apart from a Westeros obstacle course? 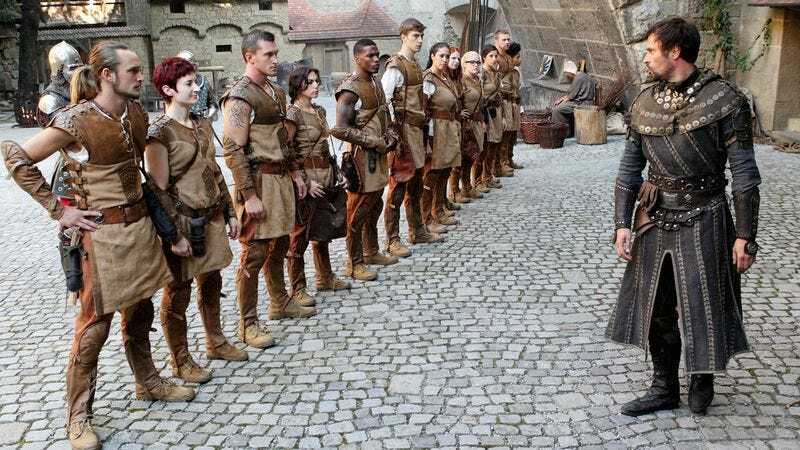 If this episode is indicative of where the show’s going, then the answer might unfortunately be, “Not much.” The generic Challenge—>Final Showdown—>Elimination Council format the show uses makes sense in terms of competition; guided by producers of The Amazing Race and Lord Of The Rings who know their audience, the production values are Renn Faire and the team challenge reassuringly straightforward. But the show’s biggest glimmers of contagious enthusiasm come from the ways in which LARP framework and selfless-hero narratives mess with old saws. While it’s a solid enough competition, it’s hard to shake the feeling that they missed an opportunity to create the scenario, present some options, and actually let a group LARP happen. It’s a decent reality show as-is; it could have been, at last, the reality show where you actually had to be here to make friends. The contestants could do it, too. Despite The Quest being largely scripted—the behind-the-scenes opener felt like a good-faith reminder—the sheer glee emanating from these Paladins provides its own spontaneous energy. (“Wait, look at that! It’s like, misty!”—actual line.) I grinned during the tunnel-to-another-world montage when Bonnie alone acts as if it’s really cold—yes, good, commit to your character early!—and cracked up when everyone got their first look at Castle Saenctum and squealed, clapped their hands in delight, or tried not to cry. Points, also, for coming up with a lineup of more women than men, and managing to avoid lily-whiteness. It’s too soon to pick favorites out of the well-meaning crowd, of course; Jasmine and Bonnie seem resourceful, and Christian does everyone the favor of bringing his Reality TV Bingo Card and some Fake Geek Girl sentiment to speed up his villain edit, but this episode wasn’t particularly about the contestants, which was fine. I could, however, have done with more of the deliciously over-the-top actors who guide or threaten our questers, and who work every second of screen time they can get. If you enjoy a good LARP, then Crio (the Dreamer) and the questionably-titled Vizier (not introduced with a chyron, but we can safely assume it’s Graduate of the Jafar School of Viziering) are up for judging based on their crowd skills. If you don’t get LARP, you can just admire the Vizier’s loaded-pause skills, which are finely honed. The episode’s second-best and most telling scene—establishing the balance of awareness and immersion the contestants will probably be encouraged to provide—happens early, as one of the actors gets attacked by an ogre and another actor leads them on a run for it. The setup’s haunted-house comedy appeal takes a turn as Shondo (whose unwavering intensity makes him an early favorite for reaction shots) calls everyone out for leaving a man behind. It’s a reasonable in-story reaction for a bunch of prospective heroes. But here’s that LARP question again: Was there actually another option? Could they have run after the ogre? The eventual outcome would probably not have changed, but would it have led to the bravest Paladin being rewarded somehow, some edge over the competition? I wonder if there was a camera crew hanging out in the bushes just in case; would the show actually be prepared for someone taking things into their own hands? It’s not the only moment that suggests a group prepared for a more complex story than they have. There’s a running sotto voce commentary in group scenes as contestants question whether they can trust a character who’s just appeared, whether they should admit to holding pieces of the Sunspear, and whether they should do what they’re told. It’s the meta-narrative of people who know their tropes and are determined not to be shown up. Accordingly, the episode’s best scene involves the group being put in a holding area and left to their own devices. In a space where one could theoretically wrangle a way out and a situation in which one wasn’t necessarily in trouble, the conflicts that arose (assume the worst and attempt to escape? Would fleeing make them look guilty?) were classic RPG options. It was a glimpse of what the dramatic build of this show could be, with the meta bonus of imagining various actors on call, waiting to burst into action for different scenarios. It’s the episode’s cleverest move, and something I hope gets revisited. Amid the genuine enthusiasm The Quest’s artifice is built on, it might be worth tuning in just to see what happens if that LARP energy finally bubbles over. I am very interested in the minor differences in everyone’s training gear, for no particular reason. “If that had been a real army, nothing—NOTHING—would be here any more.” “I’d have killed more people with my hand, throwing arrows over this wall!” It’s hard to tell who’s having a better time, the contestants or the actors. Reality TV red flag: Patrick the married schoolteacher talking about how sharing a room with Bonnie was the “safest two people to put in the same room” is either an example of how green these recruits are about the pitfalls of reality television cohabitation, or shameless foreshadowing. I hope it’s the former; I’d say this doesn’t seem like the kind of show that hopes for that, but the producers designed the sleeping arrangements, so. The Grand Vizier is welcome to be in every episode, up to and including hyper-arch talking heads sneering at everyone else’s talking heads.